This article is about the unit of mass. For other uses, see Gram (disambiguation). "Gramme" redirects here. For Gramme (disambiguation), see Gramme (disambiguation). The only unit symbol for gram that is recognised by the International System of Units (SI) is "g" following the numeric value with a space, as in "640 g" to stand for "640 grams" in the English language. The SI does not support the use of abbreviations such as "gr" (which is the symbol for grains),:C-19 "gm" ("g⋅m" is the SI symbol for gram-metre) or "Gm" (the SI symbol for gigametre). The gram was the fundamental unit of mass in the 19th-century centimetre–gram–second system of units (CGS). The CGS system co-existed with the MKS system of units, first proposed in 1901, during much of the 20th century, but the gram has been displaced by the kilogram as the fundamental unit for mass when the MKS system was chosen for the SI base units in 1960. The gram is today the most widely used unit of measurement for non-liquid ingredients in cooking and grocery shopping worldwide[according to whom?]. Most standards and legal requirements for nutrition labels on food products require relative contents to be stated per 100 g of the product, such that the resulting figure can also be read as a percentage by weight. 500 grams (g) = 1 Jin in the Chinese units of measurement. 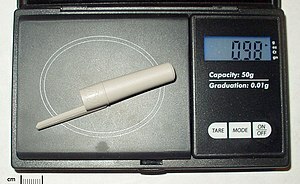 1 gram is roughly equal to 1 small paper clip or pen cap. The Japanese 1 yen coin has a mass of one gram, lighter than the British penny (3.56 g), the United States cent (2.5 g), the Euro cent (2.30 g), and the 5 cent Australian coins (2.80 g). ^ The date and authorship of this Late Latin didactic poem are both uncertain; it was attributed to Priscian but is now attributed to Rem(m)ius Favinus/Flav(in)us. The poem's title is reflected in the French phrase poids et mesures ("weights and mesures") in the title of the 1795 National Convention decree, Décret relatif aux poids et aux mesures that introduced the gram, and indirectly in the name of the General Conference on Weights and Measures responsible for the modern definition of the metric units. ^ "Weights and Measures Act 1985 (c. 72)". The UK Statute Law Database. Office of Public Sector Information. Archived from the original on 2008-09-12. Retrieved 2011-01-26. §92. ^ "Kilogram gets a new definition". BBC News. Retrieved 16 November 2018. ^ National Institute of Standards and Technology (October 2011). Butcher, Tina; Cook, Steve; Crown, Linda et al. eds. "Appendix C – General Tables of Units of Measurement" Archived 2016-06-17 at the Wayback Machine (PDF). Specifications, Tolerances, and Other Technical Requirements for Weighing and Measuring Devices Archived 2016-08-23 at the Wayback Machine. NIST Handbook. 44 (2012 ed.). Washington, D.C.: U.S. Department of Commerce, Technology Administration, National Institute of Standards and Technology. ISSN 0271-4027. OCLC OCLC 58927093. Retrieved 30 June 2012. ^ "Décret relatif aux poids et aux mesures du 18 germinal an 3 (7 avril 1795)" [Decree of 18 Germinal, year III (April 7, 1795) regarding weights and measures]. Grandes lois de la République (in French). Digithèque de matériaux juridiques et politiques, Université de Perpignan. Archived from the original on May 10, 2013. Retrieved November 3, 2011. ^ Convention nationale, décret du 1er août 1793, ed. Duvergier, Collection complète des lois, décrets, ordonnances, règlemens avis du Conseil d'état, publiée sur les éditions officielles du Louvre, vol. 6 (2nd ed. 1834), p. 70 Archived 2015-04-02 at the Wayback Machine. The metre (mètre) on which this definition depends was itself defined as the ten-millionth part of a quarter of Earth's meridian, given in traditional units as 3 pieds, 11.44 lignes (a ligne being the 12th part of an pouce (inch), or the 144th part of a pied. ^ Knorr, Wilbur R. (1996). "Carmen de ponderibus et mensuris". In Hornblower, Simon; Spawforth, Antony. The Oxford Classical Dictionary (3rd ed.). Oxford: Oxford University Press. p. 292. ISBN 019866172X. ^ Henry George Liddell. Robert Scott. A Greek-English Lexicon (revised and augmented edition, Oxford, 1940) s.v. γράμμα Archived 2015-07-17 at the Wayback Machine, citing the 10th-century work Geoponica and a 4th-century papyrus edited in L. Mitteis, Griechische Urkunden der Papyrussammlung zu Leipzig, vol. i (1906), 62 ii 27. ^ "System of Measurement Units - Engineering and Technology History Wiki". ethw.org. Archived from the original on 29 April 2018. Retrieved 29 April 2018. ^ "Circulating Coin Designs". Japan Mint. Archived from the original on 18 September 2009. Retrieved 7 March 2010. This page was last edited on 31 March 2019, at 03:41 (UTC).